We consider the path planning problem of mobile networked agents (e.g., robots) that have to travel towards assigned target locations. Robots’ path planners have to optimally balance potentially conflicting goals: keep the traveled distance within an assigned maximum value while, at the same time, let the robot reliably and effectively communicate with other robots in the multi-robot network, and reduce the risk of collisions. We propose a solution approach based on the integration of two components: a link quality predictor based on supervised learning, and a path optimizer, based on a mathematical programming formulation. 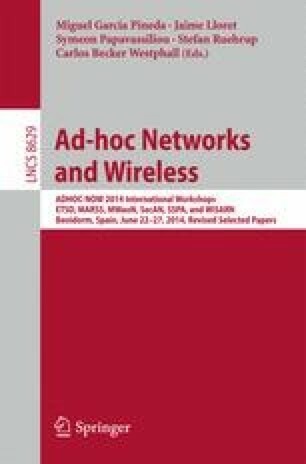 The predictor is built offline and yields spatial predictions of the expected communication quality of the wireless links in terms of packet reception rate. Exploiting shared information about planned trajectories, these spatial predictions are used online by the robots to build time-dependent spatial maps of communication quality, to iteratively assess the best path to follow considering both local and prospective links, and to plan paths accordingly. To deal robustly with dynamic environments, path planning is implemented as a multi-stage scheme using a receding horizon strategy. The framework is evaluated in realistic simulation scenarios, showing the effectiveness of using the spatial predictor for the effective online planning of network-aware trajectories. This research has been partially funded by the Swiss National Science Foundation (SNSF) Sinergia project SWARMIX, project number CRSI22_133059.